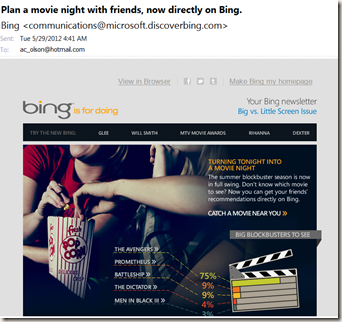 I share a "Family Calendar" with my wife on Hotmail, where we track family appointments and events. This is one of the best things that we've ever done in terms of synchronizing our lives. When I'm at work, I can see the family schedule alongside my work calendar. I can also see it on my phone. But there's a dark side. At one point, I checked the box "send me email reminders!" So, every time an appointment comes up I also get an email reminder -- and usually after the fact. Voicemail. Every time we get a voicemail, I get a copy of it in email. This sounds like a great idea in theory, but once you get behind you end up listening to messages from weeks ago. 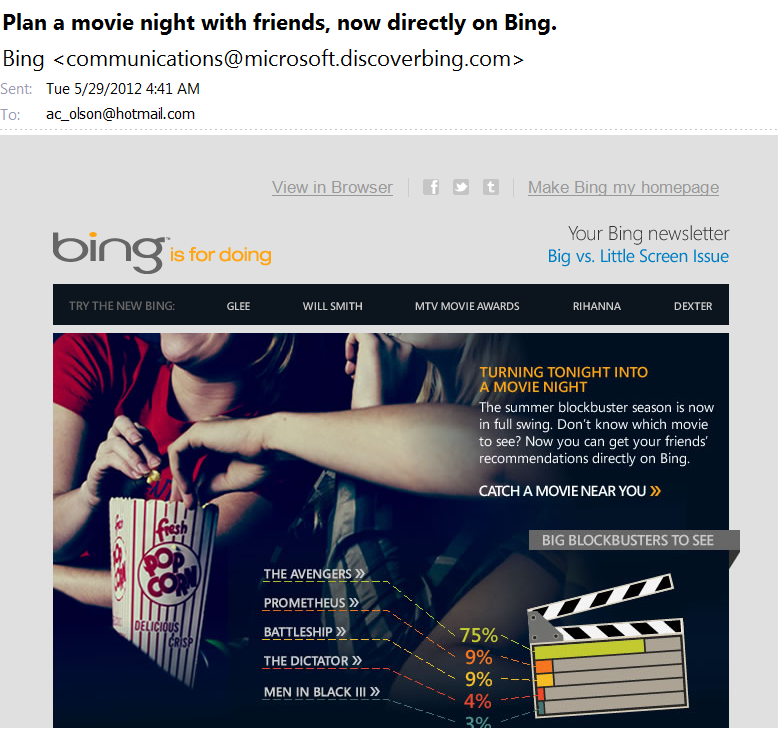 This kind of mail looks promising, but I already use Bing Movies. I'm clearly not the right audience for this. Opted out of every, single promotional mail I receive. 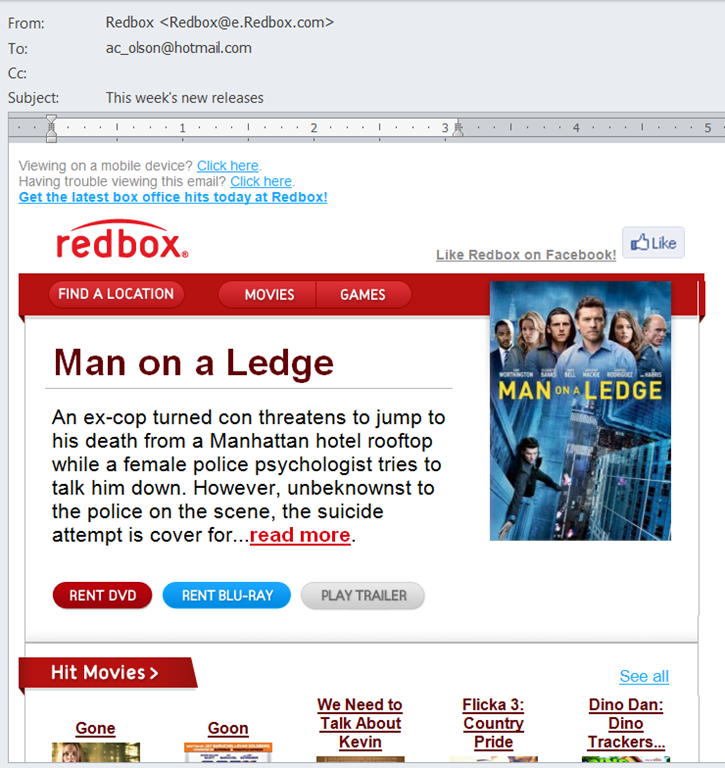 Opted out of "reminder" mails like calendar items (although I kept the voice mails). 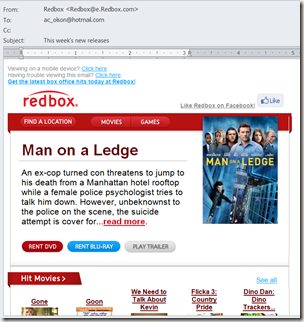 Started using Outlook 2010's Junk Mail filter more aggressively. This means if I've opted out of promotional mails and they keep sending more (including any politician who thinks I want to hear about everything they do), they get nuked. Started being more careful about when signing up for new services on the web. After a few weeks, the noise has decreased significantly in my inbox -- and I'm not writing back apologizing about taking two weeks to reply.